I recently got into this, and it is so fun and addictive! I feel like a lot of us dry land photographers are overwhelmed by the thought of this but it doesn’t have to be scary! Here is a step by step guide to getting started, from gear to editing. PROS: Least cumbersome of underwater housing models and easy to use. Easy access to your camera’s settings buttons. TTL or “Through-The-Lens” flash metering for proper exposure. Easy viewing and metering. Easy grip and handling. Easy lens zooming. Amazing quality images. CONS: Really just the price here. PROS: Low cost, no leakage, lightweight and easy to travel with, fits most larger DSLR cameras. It is very functional and does what it says. It’s easy to load and unload once you know what you are doing, and the images are unaffected by the plastic and pretty amazing. CONS: Cumbersome to use – it’s really just a plastic bag, so it’s difficult to access and adjust camera settings. There is a groove for your finger to adjust camera functions, but it is not easy to use. Again, it’s plastic, so it’s not as durable. The lens must be flush up against the lens house, so you need to make sure you have the correct adapter. It is difficult to see through the view finder. It is difficult to zoom within the housing. It is buoyant, so it is difficult to hold underwater. It’s best for shallow photography. PROS: Pre-designated underwater settings. This is a biggie! Your images don’t come out with blue skinned smurfs! No cumbersome housings. No worries about leaking or ruining an expensive camera. Easy to travel with, light, small. CONS: It’s not a DSLR. The images are not as spectacular and you lose control over many DSLR functions that would be helpful underwater, such as continuous shooting mode (this is a huge CON for me). So there you have it. I went with the EWA housing and couldn’t be happier. It’s not the easiest to use, but the images are still amazing. So now what? – I recommend shooting in continuous shooting mode, particularly if you are capturing an action shot. Underwater, most subjects are moving, so this is your best bet. – Try to get pretty close to your subject. Water tends to dull the contrast and sharpness of your image. – If you are using natural light (like I do!) try to shoot closer to mid-day than you typically would, so the light filters into the water and to your subject. You can get some nice light rays diffusing through the water in the right conditions. – Use a high shutter speed for high contrast/sharpness and to capture action. – Get creative! Some of my favorite shots are split captures, with the camera half in the water and half out. This is a very simple trick to master. – This is a no-brainer, but the clearer the water, the better for image quality. – Don’t forget about composition. Negative space can look beautiful underwater and add a sense of depth. Look for where light is reflecting – maybe in interesting patterns off the bottom of a pool, or if you have bubbles you can get some pretty cool bubble bokeh. – Shoot in RAW. It will make post processing white balance and color temperature corrections so much easier. – Get your settings as accurate as possible for underwater shooting. You want the lowest ISO possible for a reasonable shooting speed (fast is good here) and you also want to adjust your white balance/color temperature for underwater conditions. A good starting point is 9,000 K (kelvin) but will depend on your conditions and the sun. Your best bet is to use a grey card underwater. – Try to shoot in RAW so that you have more control with post fixes. – Your first step is to correct skin as much as possible in Lightroom or Adobe Camera Raw before importing to Photoshop. I use Adobe Camera Raw, but the same principles apply to Lightroom. You’re going to want to take the blue and green down significantly. – Run any presets here. I typically use a VSCO preset. – Up your contrast and clarity. – Import image into Photoshop. – After I fix the skin, I up the contrast more and A LOT. I also play around with tone curves to get the most out of contrast adjustments (try upping whites and reducing blacks). This adds more depth that is often lost underwater. – I start with my creative edits. I might deepen the color of the water by increasing saturation of blues or greens, or selectively bringing down the exposure around the subject. I sometimes enhance any light sources that are there with brushes and masks. If I have a split image, I might enhance the curve of a wave using the Liquify tool. Have fun with it! Tag your underwater images using #napcp on Instagram! Enter your underwater image in the NAPCP International Image Competition, open through August 18th, 2016! These are seriously AMAZING images. It’s incredible to see your before and after and realize just how much I don’t know about Photoshop, ha ha! Thanks so much for a fantastic share about a subject I personally know nothing about. This is great stuff! 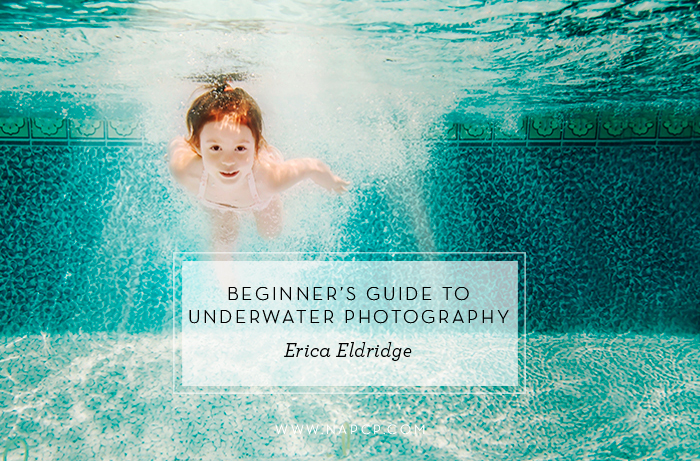 Such a great resource for those wanting to begin photographing underwater! I have so loved capturing my kids in the pool this summer, as well. It just opens up a whole new world of creativity! I decided to go with the SLP housing for my Nikon D810 and have been quite impressed with their product so far. Thank you so much for putting together an awesome post, Erica!